General Stanley McChrystal wasn’t fired for the name calling and sarcasm in the recent Rolling Stone article, or for a lack of military decorum and good discipline. He was fired for telling the truth about the mission in Afghanistan in a statement he made in March. “We’ve shot an amazing number of people and killed a number and, to my knowledge, none has proven to have been a real threat to the force.” This statement is the most embarrassing and potentially crippling to Obama’s AFPAK effort, for it brings attention to how badly the war is going with a focus on the killing of innocent people. 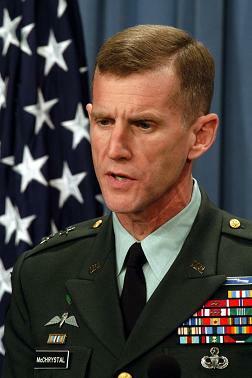 McChrystal’s statement is candid admission of the futility and failure of the so called counter-insurgency campaign. Troops are supposed to be protecting more civilians by defending them and their villages, but with the price of that security coming in part from paying off warlords, and an Afghan military with shifting allegiances, the resulting chaos ensures lots of innocents who happen to look like the ”insurgents” are just in the wrong place at the wrong time. And with simultaneous JSOC missions and drone attacks and bombardments, the human debris of collateral damage is piling up. It’s a big enough pile to bury McChrystal and move in Petreaus, ostensibly to make the “surge” work. But it could also bring more public attention to, and scrutiny of, the US/NATO mission in South Asia. Are recent Pentagon press releases about vast, untapped mineral reserves in Afghanistan, the timing of which is probably no coincidence, an attempt to put a positive, albeit mercenary spin on our involvement in the region? Interestingly, earlier this month, before the McChrystal incident, we witnessed General David Petraeus’s fainting episode at a Senate Armed Services hearing on progress in Afghanistan. Dehydration was blamed but was his syncope also his body’s reaction to some very bad back channel news he had just received regarding the PR disaster in Afghanistan and the imminent firing of McChrystal? Was McChrystal’s published candor regarding the truth of the situation just irresponsible verbal meanderings or were they words he mouthed from a script DoD prepared to reverse the spin kick-started by his boots on the ground? I’m Tim Reeder, a 52 year old registered nurse in northern California . I work from my home office and my current employment allows me the luxury of time to surf the web and stay informed. I had a brief but enjoyable stint as a journalist in the U.S. Navy in the 1980’s and was published in The Alameda Naval Airbase Courier and the national magazine, Navy Times. Glad I got out of the military before the first gulf war!